Serving clients worldwide, the trademark attorneys at Cotman IP, based in Los Angeles, can guide you successfully through the complex, yet vital procedures of registering trademarks for your valuable brands of products. Federally registering your trademark is the best way to guarantee that your trademark rights cover the broadest possible geographic region, thus promoting the greatest growth of your business. Having a specialized, experienced trademark attorney, as at Cotman IP, is important from the very beginning — in conducting searches to determine if your trademark is a likely candidate for registration and then if your proposed trademark would infringe another person’s trademark rights. This service alone can prevent you from making grave missteps and potentially bankrupting misinvestments. By submitting a well-thought-out application, an experienced trademark attorney can not only expedite the trademark examination process for you but also prevent eventual invalidations or cancellations of trademarks, resulting from irreparable errors in the initial application. Particularly as competition is increasing in the marketplace, it is increasingly important to federally register your trademarks. 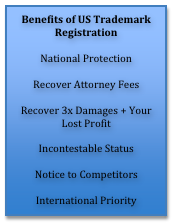 Although “common law” and state trademark laws provide you with certain legal rights, federal registration affords you remedies you would not otherwise have. If you believe your trademark is being infringed, you should immediately contact an experienced trademark attorney, as at CotmanIP, who can advise you appropriately. And to minimize damages, our NameSentry™ trademark monitoring service will protect your ongoing investment, goodwill, and branding, by identifying any third parties using confusingly similar trademarks in a channel of trade related to your uniquely valuable product or service.